› Author Affiliations Funding This study received funding from San Antonio Life Sciences Institute (SALSI) Innovation Challenge Grant. Background Through the Health Information Technology for Economic and Clinical Health Act of 2009, the federal government invested $26 billion in electronic health records (EHRs) to improve physician performance and patient safety; however, these systems have not met expectations. One of the cited issues with EHRs is the human–computer interaction, as exhibited by the excessive number of interactions with the interface, which reduces clinician efficiency. In contrast, real-time location systems (RTLS)—technologies that can track the location of people and objects—have been shown to increase clinician efficiency. RTLS can improve patient flow in part through the optimization of patient verification activities. However, the data collected by RTLS have not been effectively applied to optimize interaction with EHR systems. Methods A pilot study was conducted in a simulated emergency department using a locally developed camera-based RTLS-equipped EHR that detected the proximity of subjects to simulated patients and displayed patient information when subjects entered the exam rooms. Ten volunteers participated in 10 patient encounters with the RTLS activated (RTLS-A) and then deactivated (RTLS-D). Each volunteer was monitored and actions recorded by trained observers. We sought a 50% improvement in time to locate patients, number of rooms searched to locate patients, and the number of mouse clicks necessary to perform those tasks. Results The time required to locate patients (RTLS-A = 11.9 ± 2.0 seconds vs. RTLS-D = 36.0 ± 5.7 seconds, p < 0.001), rooms searched to find patient (RTLS-A = 1.0 ± 1.06 vs. RTLS-D = 3.8 ± 0.5, p < 0.001), and number of clicks to access patient data (RTLS-A = 1.0 ± 0.06 vs. RTLS-D = 4.1 ± 0.13, p < 0.001) were significantly reduced with RTLS-A relative to RTLS-D. There was no significant difference between RTLS-A and RTLS-D for patient identification accuracy. 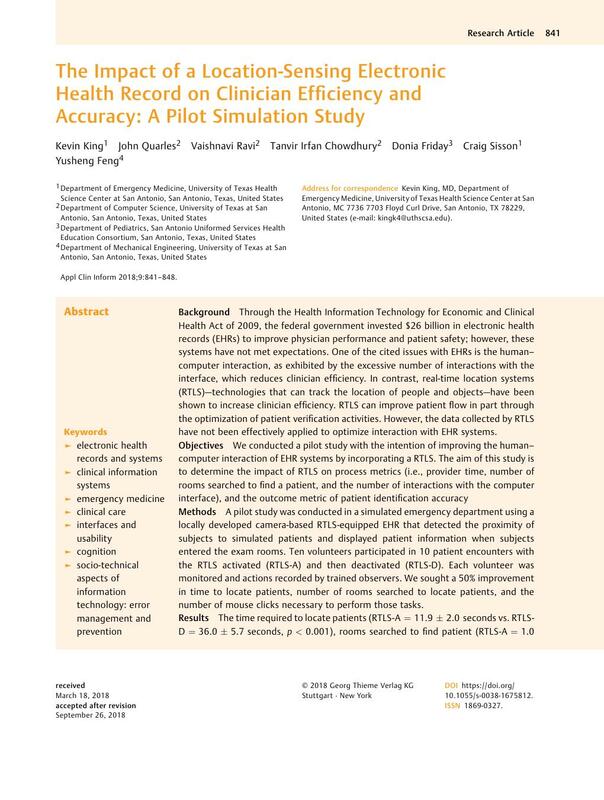 Conclusion This pilot demonstrated in simulation that an EHR equipped with real-time location services improved performance in locating patients and reduced error compared with an EHR without RTLS. Furthermore, RTLS decreased the number of mouse clicks required to access information. This study suggests EHRs equipped with real-time location services that automates patient location and other repetitive tasks may improve physician efficiency, and ultimately, patient safety. The views expressed herein are those of the authors and do not reflect the official policy or position of San Antonio Military Medical Center, the U.S. Army Medical Department, the U.S. Army Office of the Surgeon General, the Department of the Army, the United States Air Force, Department of Defense, or the U.S. Government. K.K., J.Q., Y.F., and C.S. conceived the study. J.Q., Y.F., V.R., and T.I. designed and wrote the software. K.K., J.Q., V.R., and T.I. performed the data collection. K.K. and D.F. conducted the article search and drafted the article. All authors contributed substantially to article revision. K.K. takes responsibility of the work as a whole. This study was reviewed and approved by the University of Texas Health at San Antonio Institutional Review Board.